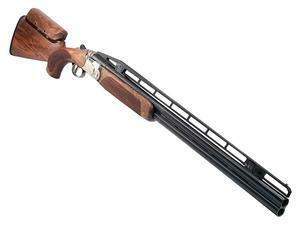 The Beretta 692 US Trap over-under shotgun falls right in between the vault-like DT10 and the trimmer 680 series. At its core is a 1.6 inchwide receiver designed to give superior balance and stability as well as intuitive shouldering and fast target acquisition by placing more weight between the hands. The action is engineered to withstand the rigors of tens of thousands of rounds of serious training and competition; with its two huge locking lugs and replaceable barrel shoulders. And giving you adjustable trigger; adjustable ejection-extraction; adjustable balance and (optional) adjustable comb; the 692 can truly become an extension of your body. With cutting edge technology and great design; the 692 lives to break clays; but would not be out of place for the occasional bird-hunt. Features adjustable elevation vented rib.